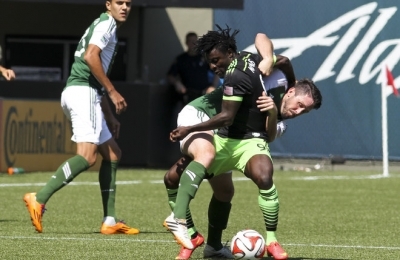 Seattle Sounders FC 2 (S2) association football club have maintained a streak with their third home win at Starfire Stadium in Tukwila, Washington on Saturday night, this time against Portland Timbers 2 (T2). T2 struck first when defender Harrison Delbridge headed the ball in from a free kick in the 30th minute. Seattle responded with Pablo Rossi converting a penalty kick early in the second half and Giuliano Frano tapping a lobbed pass into the net in the 88th minute. Final score, 2–1 Seattle. In the 30th minute, T2 midfielder Blair Gavin placed the ball nicely for Delbridge who connected cleanly with the ball to head it past S2 goalkeeper Charlie Lyon. At half, the game still stood with Portland in the lead 1–0. In the first minutes of the second half, S2 Andy Craven was pulled down in the penalty box by T2 Andy Thoma. Rossi was able to convert the penalty with a strong strike to the top left corner. T2 keeper Jake Gleeson was unable to stop the shot. Frano's goal came in the 88th minute as he was able to chip the ball into the net after nice build up play by the Sounders. The Timbers did look dangerous on corners having earned 8 to Seattle's 3.